For other people named Anne Smith, see Anne Smith (disambiguation). Anne Smith (born July 1, 1959) is an educational psychologist known for her past as a professional tennis player from the United States. Smith's highest women's doubles ranking was World No. 1 in 1980 and 1981. Her highest singles ranking was World No. 11 in 1980. Greer Stevens 3–6, 6–6 ret. Note: The Australian Open was held twice in 1977, in January and December. She received a Bachelor of Arts in psychology from Trinity University and a doctor of philosophy in educational psychology from The University of Texas. Smith is a licensed psychologist in Texas, and Massachusetts,. She was Director of the Learning Center at Dean College in Franklin, Massachusetts. 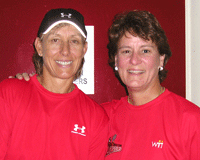 She was the coach of the WTT Boston Lobsters team in 2005, 2006, and 2007. Smith is the author of Grand Slam: Coach Your Mind to Win in Sports, Business & Life, with a foreword by Billie Jean King, and The MACH 4 Mental Training System: A Handbook for Athletes, Coaches and Parents. On August 22, 2012, Smith appeared in an episode of Storage Wars: Texas where she appraised the value of a tennis racket restringing machine that had been won in a storage unit auction. ^ a b c "About | Dr. Anne Smith". Annesmithtennis.com. 2013-01-18. Retrieved 2014-01-06. ^ "Storage Wars: Texas Episode Guide – Season 2 – A&E". Aetv.com. Retrieved 2014-01-06. This page was last edited on 25 February 2019, at 21:24 (UTC).